Dr. Sanusi Umar, a world-leading follicular unit extraction (FUE) hair restoration physician, has announced a patent issued by the United States Patent and Trademark Office for his invention, UGraft Revolution(™). UGraft Revolution(™) is an advanced FUE technology, specially engineered for the needs of body hair to head hair transplant surgery as well as hair restoration for patients of African descent. The use of donor hair from the body is an emerging area within the hair restoration field. Conventional transplant surgery relies on hair grafts from the patient’s scalp. However, there are many cases where patients lack sufficient quantities of head hair. In these circumstances, hair from the body can be used to expand the available donor supply for these types of patients. Dr. Umar has used this technology to successfully perform these procedures for years and has published on methods of use in several highly regarded, peer-reviewed dermatology and plastic surgery journals. The result of using the UGraft(™) technology has been the ability to credibly transplant even severely bald individuals, patients who require extreme forms of hair transplant repair and younger men in their earlier stages of baldness. Patients in their teens, twenties, and thirties face more rapid rates of hair loss and the risk of greatly diminished donor hair for future repair work. Therefore, the use of body hair follicles allows them to undergo hair transplantation much earlier in life, if they are well prepared for the likelihood of needing future surgeries. Attaining additional follicle grafts from body regions offers such patients the renewed hope of achieving their vision of global coverage they would most prefer. The challenge of harvesting body hair lies in their extremely sharp growth angles. Therefore, these hair follicles face a high risk of injury with regular cylindrical Follicular Unit Extraction (FUE) punches. The United States Patent Office had previously issued a patent for the UPunch® component of Dr. Umar’s UGraft(™) hair transplant system. Rather than a cylinder, UPunch® has a much safer curved cutting directed away from the hair follicle. It also includes a gentle pulling mechanic to gently separate the graft from its surrounding tissue attachments. The current patent is for the UGraft Revolution(™) component that drives the UPunch®. It also includes a foot pedal controlled fluid irrigation and flushing system that enables a rapid hands-free grafts retrieval. Additionally, the irrigation system keeps the grafts hydrated during the extraction process. This is an important development since drying of grafts is a usual cause of graft death and poor growth following hair transplantation. Most patients of African descent have tightly curled to helical hair. In these individuals, the hair beneath the skin is also tightly curled to helical. Conventional FUE punches tend to break and kill the grafts as they are unable to negotiate the curvature of the helical grafts underneath the skin. Further compounding the dilemma is the observation that in most of these patients, the connection between the grafts and surrounding tissue is tighter and tougher. 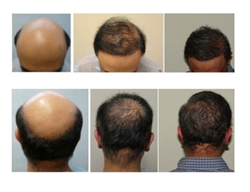 “UGraft’s(™) design and engineering was specifically created to overcome these challenges, resulting in successful FUE in almost all presenting patients within this demographic,” says Dr. Umar. Before its patent issuance, the capabilities of UGraft(™) combined with UPunch® had already garnered the attention of leading medical publications through articles authored by Dr. Umar in the Annals of Plastic Surgery, The Plastic and Reconstructive Surgery Global Open, JAMA Dermatology, Journal of the American Academy of Dermatology, Dermatologic Surgery, Facial Plastic Surgery Clinic North America, Journal of Plastic and Reconstructive Surgery, among others. Reported cases using this methodology have included patients with various forms of insufficient donor hair, those needing strip scar repair, as well as those requiring hairline, eyebrow, or eyelash transplantation using leg hair. Additionally, Dr. Umar’s work using UGraft Revolution(™) has also been featured in mainstream magazines and television segments such as Good Morning America (eyebrow hair transplantation) and The New York Times (leg hair to hairline transplantation), NBC, Elle Magazine, and the Hollywood Reporter. While today’s conventional hair restoration methods are capable of achieving extremely natural looking outcomes, their reliance on head hair leaves many underserved patients who require far more donor grafts. Additionally, African American patients – on account of their tightly curled or helical hair structure – have not benefited from linear-scar-free FUE surgery since conventional punches cannot safely extract their hair in most cases. The ability of body hair to act as an additional reserve offers enormous hope for other patients who are considered challenging or impossible to transplant due to depleted scalp donor source. The astute engineering of UGraft’s(™) revolutionary technology allows these patients to achieve the global coverage they want, instead of living with suboptimal cosmetic outcomes. And for the first time, almost all African American patients with tightly curled or helical hair can undergo the linear-scar-free FUE type of surgery with consistent results. “For those who typically prefer a shorter haircut, the arrival of the UGraft(™) is a welcomed development,” says Dr. Umar. According to Dr Umar, the UGraft(™) system is in full production and would be commercially available for purchase by hair restoration surgeons during 2015. The hair transplant industry has expressed a great deal of interest in the system with a waiting list of clinics and surgeons for this technology from all over the world.